The concert hall at the Sydney Opera House holds 2,700 people. This blog was viewed about 11,000 times in 2014. If it were a concert at Sydney Opera House, it would take about 4 sold-out performances for that many people to see it. This entry was posted in Uncategorized and tagged Sydney Opera House on December 30, 2014 by Karina. I have been following Rachel Carrera’s Blog for nearly as long as I have been writing my own here at WordPress. Rachel is always witty and informative, whether sharing stories about her family (human & feline) and living with autism, interviewing authors, congratulating authors on their birthdays or inventing games her readers can participate in. I love hopping over to her blog to see what she is up to and it is always a pleasure to find one of her posts in my Reader. One day I hope to read one of her novels. In one of her posts she mentioned that her birthday was on the 22nd of December. Many Happy Returns! For your birthday I wish you health, happiness & the publication of one of your novels. May you have a wonderful day & a great year ahead. This entry was posted in Comments and tagged birthday, blog, Rachel Carrera on December 22, 2014 by Karina. ‘Rubbish!’ Nkosi spat out. Drunk, he stood before Zuki with crumpled Christmas gift paper piling around his naked feet. He tossed the last of the presents, still partly wrapped, across the room. ‘Rich people’s rubbish,’ he hissed and fell back on his bed. A few seconds later he began to snore. Zuki surveyed the scene before her. Nkosi had just come back from one of his ‘trips to town’, as he and his buddies called their looting excursions to the affluent suburbs of the city. They never went for anything big, specialising in petty crime only. But the last trip had been a total disappointment. They’d cruised for hours without an opportunity presenting itself until, at last, they saw a woman put a heavy box into the boot of her 4×4 and return to her house without locking the car. Nkosi grabbed the box and they made their escape. At least that is what Zuki had gathered from her brother’s earlier rant. Now, the contents of the box lay strewn in front of her and Zuki felt a pang of guilt when she imagined how it would feel to discover the box gone. She picked up a piece of the Christmas paper which had landed near the door. Half a gift card was still attached to it. Zuki fingered it and straightened out the wrapping around it. One by one, Zuki traced the letters with her forefinger, deciphering them with some effort and pronouncing them softly under her breath: ‘TO KRISTIN AND WIGGO FROM…’ The giver’s name was missing. Zuki crouched and retrieved the object which had so infuriated her brother. She hugged the stolen present to her chest. On tiptoe she made her way back to the sofa in the front of the house where she slept. The air was stagnant with the summer heat. Her father was asleep in the only other room. The full moon illuminated the sofa through the window. Once settled, Zuki finished unwrapping the present and found herself staring into the lovely face of the American First Lady whom she’d recently seen on TV during the coverage of the her husband’s re-election campaign. She suddenly realised that she hadn’t properly held a book since dropping out of school three years ago when her mother died and Zuki took over her work as a char at Ms Murray’s. Ms Murray had shelves and shelves of books in her house, but Zuki only ever approached them with a feather duster. Pointing out the letters with her finger, Zuki gradually made out the title of the book and smiled. 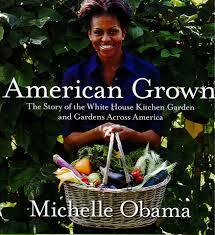 On the cover, Mrs Obama held a basket full of vegetables in all the colours of the rainbow. Even though Zuki did not recognise most of the vegetables, the picture made her mouth water. Especially the cucumber. In summer, Ms Murray often made cucumber sandwiches for her tea and always shared them with Zuki. Inside the book, Zuki found many more photographs of Mrs Obama, surrounded by children, working in a garden, all busy with wheelbarrows and spades and rakes, then proudly showing off their vegetables in front of the camera. The people in the book appeared so relaxed and happy. Zuki hadn’t known happiness since her mother’s death. Although it was difficult to admit, deep down inside she knew that her father was a drunk, her brother a chancer, and that her mother died because her father ordered her to visit a witchdoctor when she discovered lumps in her breast, instead of taking her to a clinic. But Zuki preferred not to dwell on things beyond her control. She was grateful for a roof over her head and didn’t mind giving most of her earnings to her father, just as long as he left her enough to feed them all. Even if what they could afford was mostly umngqusho or rice. In one of the photographs, Mrs Obama was crouching next to a patch of plants Zuki did not recognise. The small-print text next to the picture looked daunting. At the top of the page, spelling the words carefully to herself, Zuki could make out a caption: “How Times Have Changed”. In her dreams that night Zuki was in a garden and suddenly found herself face to face with the First Lady who held out to her a funny-shaped, purple vegetable. ‘Do you know what this is?’ Mrs Obama asked her. Zuki had to shake her head. Waking up she felt her stomach grumble. Her dream made her feel ashamed. She hid Mrs Obama’s book under her sofa. At work that day, Ms Murray was surprised to find Zuki paging through the commemorative U.S. election special issue of Time magazine. Ms Murray had not liked the idea of Zuki being torn out of school to work for her, but understood the situation and was glad that there had been at least something she could do for the family when her mother passed away. Zuki had never complained or indicated that she missed school, so it somehow surprised Ms Murray to see her looking so intently at the magazine in front of her, pointing, and mouthing the letters which stood to attention before her nail. She was so absorbed that in answer to Ms Murray’s hello she jumped up from her chair, spilling the remains of her tea over the magazine. ‘I didn’t mean to scare you,’ Ms Murray said and turned on the kettle. Apologising, Zuki started wiping off her tea from the full-spread picture of the American First Family. ‘Are you happy that Obama was re-elected?’ Ms Murray asked unexpectedly. They had never talked politics before. ‘I know very little about –’ Zuki paused. ‘Reading?’ Ms Murray probed and Zuki nodded tentatively. Zuki remembered the book at home and nodded again. ‘You know, I could help you,’ Ms Murray said. ‘Would you like that?’ she added carefully. Zuki raised her eyes. In them Ms Murray found her answer. In the afternoon, still glowing from the offer, Zuki went outside with a cool drink for Ms Murray’s gardener. ‘Do you mind if I take some of these home?’ she asked, pointing at some plants which resembled the ones she remembered from Mrs Obama’s book. Alone on her sofa late that night, Zuki opened Mrs Obama’s garden book and held the thyme and rosemary twigs close to her nose. She smelled change in the palm of her hand. Originally published as “Mevrou Obama se tuin” in By on 21 December 2013. This entry was posted in What I've Written and tagged American Grown, Christmas story, garden, Karina M. Szczurek, Karina Magdalena Szczurek, Karina Szczurek, love of reading, Michelle Obama, Mrs Obama's Garden, Obama, reading, South Africa, township on December 20, 2014 by Karina. 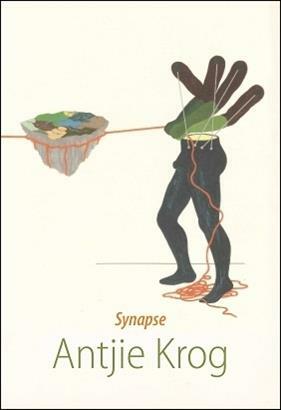 Reading Antjie Krog’s latest volume of poetry translated into English, Synapse (Mede-wete in Afrikaans), I was faced with an old personal dilemma: How much hard work is too much in order to reach that moment where meaning and aesthetic pleasure reveal themselves to you as a poetry reader? I don’t have an adequate answer. Perhaps everyone’s threshold is different anyway. In the end all you have is your very individual frame of reference, as a friend recently reminded me. In any poetry volume you will find poems which will immediately speak to you. Others will require a specific key to unlock a feeling of appreciation. Rereading, research, or exploration of context will eventually reward your effort. Some poems will forever remain inaccessible no matter the amount of goodwill you put in. And then there will be those which will simply leave you cold. The poems in Synapse fit into all these categories. The volume is divided into two parts: The Yard and Four Efforts in Linguistic Synapse Tracing. The first part opens with a series of epigraphs which are followed by thirteen poems, all focused on the images of the yard and the farm. These I find the strongest and most captivating in the book. In the epigraphs we are introduced to spaces in which the land and its ownership take centre stage and gender roles are clearly defined. The poems speak of the death of a patriarch, familial roots which reach into a troubled past, grief, guilt, race relations, and the ancient questions of owning and belonging. As the poem 11. fossilised tree trunk makes clear, everything is connected, embedded, echoed throughout history. And yet, everything changes: “after all the years we gurgle (the only outlasting ones) / burdened with the dying light and bloodsick with heritage / : the new ones prepare to enter the yard” (13. old yard). At the heart of one’s relationship with the land are beauty and language: “places that could always snap my skeleton into language / coil me into voices bore into my entrails / expose a certain wholeness of belonging as my deepest tongue / tear chorales and something like discord from my brain” (6. live the myth). This is the kind of poetry that leaves one gasping for air, which opens up new spaces in one’s understanding and feeling about the past and everyday reality in this country. The Yard continues with poems which grapple with morality and reconciliation. The idea of interconnectedness is challenged in hold your ear to the tear in the skin of my country where already the format of the poem signals separate spheres of understanding the concept of forgiveness. The words of the speaker of the first section, Cynthia Ngewu, who testified in front of the Truth and Reconciliation Commission about the murder of her son, one of the Guguletu Seven, cascade onto the page like a waterfall. The neat couplets which follow represent an ordered attempt to understand the motives and worldviews of the officer who was involved in the killing. In the end, we are told, “it was futile to try to weave interconnectedness into / the concrete bunker that lives inside Mr Barnard’s whiteness”. The bleakness of moving beyond such divisions is captured in miracle where South Africa’s relatively peaceful liberation is juxtaposed with present-day, all-consuming greed and violence: “we have become the prey of ourselves caught up / in ethnic avarice and total incapacity for vision”. More intimate poems about ageing, memory, grand-motherhood, domesticity, or the I-you constellation of lovers reveal the wonders of the world along deeper philosophical questions about our capabilities and responsibilities. The tone ranges from sombre to light-hearted. Krog is one of the few poets out there who can smuggle Skype, wifi, the Internet and memory sticks into poetry and make them look as if they almost belonged. Also, when she swears, she makes it count. The poem convivium astounds with its breadth: “what use my caress in the breath-earthed night if a centre- / less universe opens space in the nonexistent for dark / matter to overpower a few broken beads of light?” The poem, like the human body at the core of its universe, “tuneforks such abundance”. Apart from a handful exceptions, especially the Lament on the death of Mandela, the latter part of the volume, specifically the obfuscated Four Efforts in Linguistic Synapse Tracing left me baffled. The tightness and clarity of the preceding poems dissolved in musings where it became more and more difficult to follow the poet on her journey. The academic in me insisted I persevere and come to grips with the pieces, but the Sunday morning reader just wanted to return to the earlier poems in the collection or open another book. The Sunday morning reader won. A ‘butchered’ version of this review appeared in the Cape Times on 19 December 2014, p. 12. This entry was posted in What I've Read, What I've Written and tagged academic, Afrikaans, ageing, Antjie Krog, beauty, belonging, capabilities, Cape Times, connected, country, Cynthia Ngewu, death of a patriarch, divisions, domesticity, echoed, embedded, epigraphs, everyday reality, familial roots, forgiveness, Four Efforts in Linguistic Synapse Tracing, gender roles, grand-motherhood, greed, grief, Guguletu Seven, guilt, history, Human & Rousseau, I-you constellation, interconnectedness, intimate poems, Karen Press, Karina M. Szczurek, Karina Szczurek, Lament on the death of Mandela, land, language, lovers, Mede-wete, memory, miracle, morality, ownership, owning, personal dilemma, philosophical questions, poetry volume, race relations, reconciliation, responsibilities, review, South Africa, space, Sunday morning reader, swearing, Synapse, The Yard, translated into English, TRC, troubled past, Truth and Reconciliation Commission, violence, volume of poetry, wonders of the world on December 19, 2014 by Karina. Just when he thought that his life is going to be all peace and quiet after giving up a career as a lawyer to restore old boats, Richard is called in for an emergency at the shelter for mistreated tokoloshes where he volunteers. There he meets Lun. After a false start, they become friends and embark on a roller-coaster adventure which takes them across the country to Nieu Bethesda and back in search of the grain of truth at the heart of an ancient myth. They receive assistance from Emily and Sindiwe, midwives of a secret order. Hot on their heels are a ruthless drug lord and a world-class assassin. I’m not a fantasy fan, but I have enjoyed some of Salomon’s award-winning short fiction. 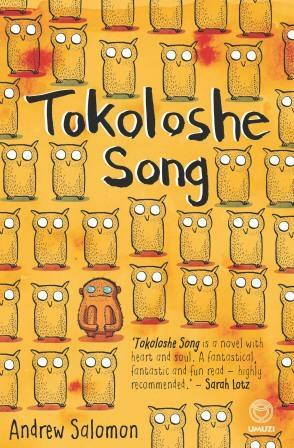 Tokoloshe Song is his debut novel for adults and is as delightful and entertaining as his stories. This entry was posted in What I've Read, What I've Written and tagged Andrew Salomon, book mark, Cape Times, fantasy, Karina Szczurek, Sarah Lotz, tokoloshe, Tokoloshe Song, Umuzi on December 19, 2014 by Karina. Within a short period of time a lethal flu wipes out 99% of the world’s population. Civilisation as we know it grinds to an abrupt halt. Station Eleven tells the story of a handful of survivors of the mayhem which ensues. At its centre is the resourceful Kirsten of the Travelling Symphony, a group of actors and musicians performing Shakespeare. Spanning a few decades before and after the collapse, Mandel draws a bleak picture of humanity, but the darkness is penetrated by flashes of light and goodwill. Creativity, art, self-expression pave the way to society’s precarious rebirth as the individual characters realise how strongly the drive to be remembered is anchored within them. 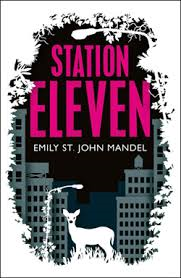 A thrilling page-turner which is simultaneously though-provoking and entertaining, Station Eleven is being deservedly compared to the likes of Margaret Atwood. This is speculative fiction at its best. This entry was posted in What I've Read, What I've Written and tagged art, book mark, Cape Times, collapse, creativity, Emily St. John Mandel, flu, Karina Szczurek, Mandel, Margaret Atwood, memory, need to be remembered, Picador, speculative fiction, Station Eleven on December 19, 2014 by Karina. Sanna never liked polishing the silver. She would have preferred to iron the white damask tablecloth the new Mrs Joubert brought over from home. She told Sanna her mother had given it to her as a parting present. Sanna listens to the huffs and puffs of the iron in the next room. She puts aside the last spoon and continues with the forks. Forks are tricky. You have to work the cloth carefully around the tines; the task is too much for her impatient chubby fingers. She takes a deep breath, trying to keep her cool. A cinnamony smell penetrates her nostrils. She looks at the big pot of stewing dried fruit, bubbling happily on the stove. It could also be the half-moon cookies Missus has put in the oven. Rubbing Silvo into the cutlery, Sanna thinks of going home this afternoon; of her sister’s house in Worcester; the kitchen there buzzing with activities; her nieces and nephews, eagerly awaiting the next morning. She takes a sip of coffee Mrs Joubert has made for her before ironing. She still cannot get used to the idea of having anything served to her, especially not by the Missus – or Zosia, as she insists on being called. Old Mrs Joubert would never even have thought of it. But this one, this one was not born and bred here; she is different with her strange European ways. Sanna likes her. In the other room, Zosia glides the iron over the intricate patterns of the white tablecloth. She breathes in the damp, warm smell of ironing. Her mother taught her to do it, insisting early on that she must know how to take care of herself. Housework always makes Zosia feel close to her. In this house, having Sanna to do most of it for her is difficult to get used to, but she understands the necessity of providing her with a job. When the tablecloth is ready, Zosia walks to the dining room holding it up between her outstretched arms. 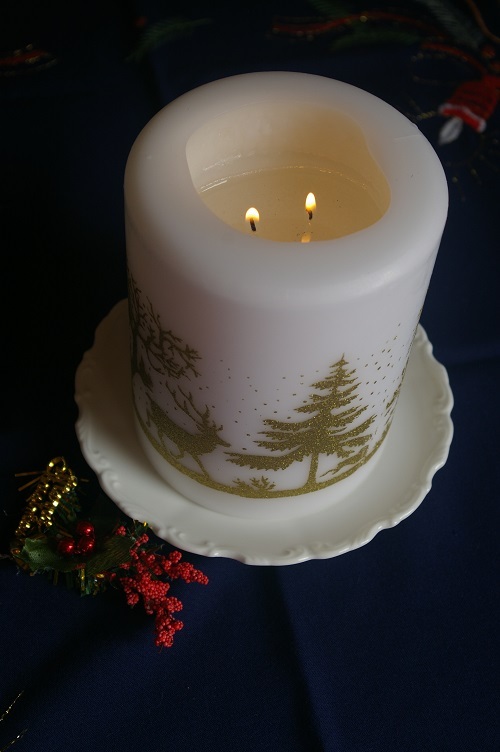 She places it carefully on the table and smoothes it around the edges with her hands. She puts the red placemats she bought for the occasion on top. She can already see how beautiful the silver will look on them. ‘Sanna, how are you coming along?’ Zosia calls into the kitchen. ‘Almost ready,’ Sanna replies, polishing the last knife. 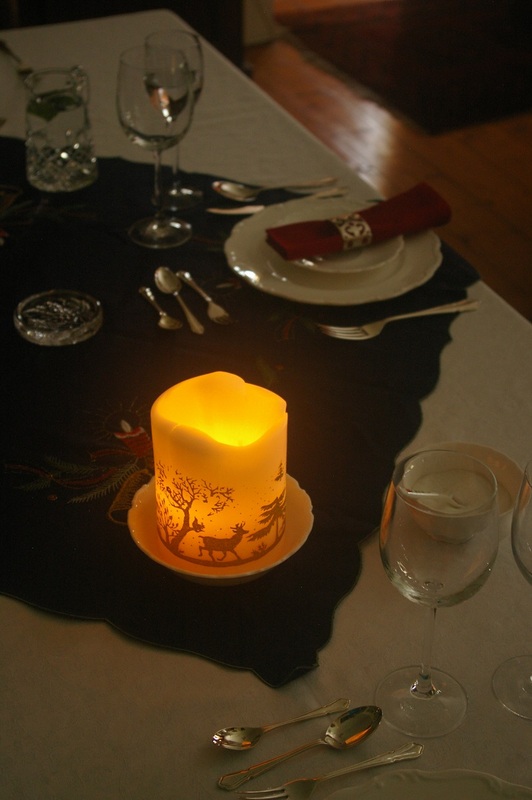 Zosia puts long red candles on the table, then takes out some plates and glasses from the side cupboard. As Sanna comes through with the cutlery a few minutes later, Zosia is busy placing red and silver cone-shaped napkins into the neatly arranged soup plates. Sanna shakes her head slowly, placing the cutlery next to the plates. ‘The most important Christmas meal on the 24th; twelve different dishes; no meat, just fish; waiting for the first star in the sky to appear before sitting down to dinner; opening presents on Christmas Eve; setting the table for a guest who never comes…’ In her head, Sanna repeats the list of strange customs Zosia has told her about in the last few days. The ancient Hoover reminds Sanna of the old Mrs Joubert, always insisting on having the house vacuumed daily. She never said ‘please’ or ‘thank you.’ She passed away at the beginning of the year. After the funeral Johan decided to move back home with his outlandish wife whom he had married overseas without inviting the family. His mother never forgave him for it. Sanna tucks the duvet in underneath the mattress and smoothes over the bed before putting the pillows in place. She hears Zosia call that lunch is ready. In the kitchen, she picks up her plate and takes it to her room in the back of the house where she always eats alone. ‘I wish she’d join us,’ Zosia tells her husband sitting at the kitchen table. In her room, Sanna enjoys the salad. Her little suitcase is packed and ready to go. An extra bag leans on it. With the unexpectedly generous Christmas bonus she has bought some treats for her family. ‘Thank you,’ Sanna says and before she turns to go adds a shy ‘Merry Christmas’. ‘And merry Christmas to you, too. Enjoy your holiday, Sanna. We’ll see you after New Year.’ Zosia walks up to her and gives her a cautious hug. Sanna does not know how to react. She rushes out of the kitchen. At the station, the bus is late. Johan insists on staying until it arrives, but Sanna tells him not to worry and to go back home. Half an hour later it is announced that the bus to Worcester has broken down and no other will be going there until the next day. Back at the house, Johan helps Zosia with the preparations for their first Christmas dinner together. For the first time in years he is excited about the festive season. Overseas there was nobody really to share the occasion with before they met, and he never felt like coming back home to his mother’s overbearing presence and suffocating piety. He’d left on a job contract the moment an opportunity arose. Meeting Zosia on one of his business trips to Berlin where she was working at the time was like discovering a new continent. All day long Johan has been watching her rituals for the festivities, which felt refreshingly like a safety net and not a wet bag. He has been delegated to set up the Christmas tree and get fresh Cape salmon from town. Zosia insisted on a local fish and recipe for tonight. He happily obliged. While she is busy with the last touches on the dinner, Johan goes into the dining room to admire the decorations on the table and choose a wine to go with the Cape salmon. They both look up at the sound of the door bell. ‘Who could…?’ Johan strides over to the intercom, followed by Zosia, wiping both hands on her apron. ‘No, it’s Sanna!’ Johan buzzes the gate open for their housekeeper. Flustered, she explains about the bus. While Johan considers other options for getting Sanna safe home for Christmas, Zosia comes up with a simple solution. ‘But…’ Sanna is at a loss for words. ‘No buts, please, come. You can tell me how the salmon turned out. And for once, the extra plate at the Christmas table won’t remain empty.’ She smiles reassuringly and ushers Sanna through to the dining room, taking her luggage from her. A while later Zosia is busy dishing out the food in the kitchen and Johan opens a bottle of wine. Sanna sits alone at the decorated Christmas table and does not know what to do with her fidgeting hands. With the left one she raises her fork, turns it, and watches the candlelight reflect off its polished tines. She puts it down again. Then with her right hand she picks up the spoon and inspects her image in its concave surface. Upside down, her head looks small, her torso elongated. She likes the slimmer version of herself. She turns the spoon and sees her still distorted face, but now the right way up, staring back. Her mouth is bigger than all her other features. She twitches her lips, opens them slightly and smiles. Slowly, from ear to ear. ‘Dinner is served,’ Zosia enters with the salmon from the kitchen. First published as “’N SILWER LEPEL” in By on 20 December 2008. This entry was posted in What I've Written and tagged A Silver Spoon, By, Christmas, Christmas story, Die Burger, Karina M. Szczurek, Karina Magdalena Szczurek, Karina Szczurek on December 17, 2014 by Karina. Chief Inspector Henrique Monroe of the Lisbon Police Department is brilliant at what he does, but gets help from a very unusual source. When a successful businessman is murdered under strange circumstances in his home, Monroe is called to investigate. The complex case awakens memories of Monroe’s distant past of growing up in Colorado with his younger brother Ernie, and threatens to unravel the fragile new reality the cop had been constructing around himself in Portugal ever since. His search for truth takes him to the country’s highest echelons of power. What he finds is horrifying, but tragically common. The Night Watchman portrays a troubled, corrupt society any South African reader will recognise. Tense, deeply felt, the novel asks a pivotal question: “Was it a paradox that truths left unspoken ended up taking away your voice?” The disquieting answers it provides are heart-breaking. 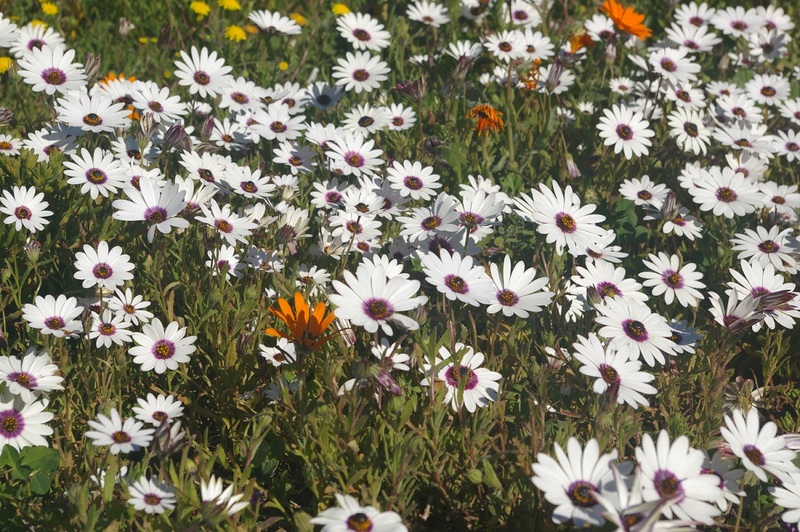 Book mark first published in the Cape Times on 12 December 2014. In 1990 the discovery of seven manuscripts of the sixteenth-century Kabbalist Berekiah Zarco sparked Richard Zimler’s internationally bestselling novel The Last Kabbalist of Lisbon (1996). 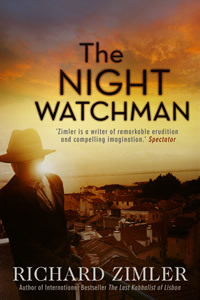 Following its success, Zimler, an American living in Portugal, published two other novels about the Portuguese-Jewish Zarco family: Hunting Midnight (2003) and Guardian of the Dawn (2005). The Last Kabbalist of Lisbon explores the fates of the Jewish community at the time of the Lisbon massacre of April 1506. Partly set in nineteenth-century Africa, Hunting Midnight is the story of a friendship between the Portuguese John Zarco Stewart and an African healer and freed slave named Midnight. Guardian of the Dawn takes us back to Goa at the time of the Catholic Inquisition in the seventeenth century. The fourth novel in Zimler’s independent historical novels series is The Seventh Gate. Set in Berlin of the 1930s, it portrays Hitler’s brutal rise to power and the effects it had on the Jewish community and the disabled long before Second World War began. It subtly exposes how a whole nation could succumb to the madness of the Nazi regime; some willingly, others under extreme pressure. Meticulously researched and vividly brought to life, Zimler’s Berlin of the 1930s is a nightmarish place where loyalty between family members and friends as well as each individual’s sanity and heroism are tested to the limits. In spite of its harrowing topic, The Seventh Gate is the kind of novel that makes you relax after the first twenty pages, knowing that there is another five hundred in store for you before the final curtain falls. 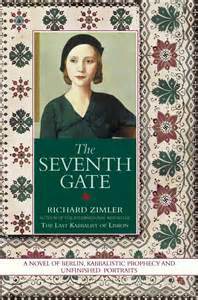 Driven by superbly drawn characters, strong dialogues, and the unusual but beautifully touching love story at its centre, The Seventh Gate is a tribute to all the people who suffered similar fates at the hand of the Nazis as the characters in the novel. The story is told by Sophie. In the Preface of the novel she is a fragile eighty-nine year old living in America and being taken care of by her nephew. After a spell in the hospital she decides to entrust him with her memories of the past when she was a teenage German girl in Berlin of the 30s and the world began to fall to pieces. Sophie tells the story of Isaac Zarco, a descendant of the Kabbalist Berekiah Zarco, and the members of The Ring, now a clandestine group of Jewish activists trying to fight the Nazi regime. It is also the story of her brother Hansi, a distant child whom Sophie loves dearly and whose life is threatened by the Nazis. Misunderstood by her mother, betrayed by her father and Tonio, the boy she has a crush on, Sophie has to make some tough choices, trying to protect Hansi and her friends from the Nazi onslaught. The sudden wave of mysterious murders, disappearances and forced sterilizations makes her and Isaac realise that Berekiah Zarco’s worst fears might be about to come true, centuries after he wrote his manuscripts. Artistically talented and mischievous, Sophie is a heroine one will not easily forget. Her passion for the cinema, her growing sense of righteousness, her awakening sexuality, and her selfless devotion to the people she loves sparkle with authenticity. The novel is interspersed with the poignant sketches she draws of her friends, adding to this overall effect. In an interview with Boyd Tonkin, Zimler stated that the relationship between the siblings Hansi and Sophie is his “monument” to the victims of the Nazi war on the disabled. The author expressed his wish that “every reader who reads the book with an open heart will be devastated by what happens to them both.” Because of the powerful storytelling of The Seventh Gate one cannot help but be. Review first published in the Sunday Independent on 25 November 2007. This entry was posted in Uncategorized, What I've Read, What I've Written and tagged acts of courage, African freed slave, African healer, American living in Portugal, Berekiah Zarco, Berlin of the 1930s, book mark, Boyd Tonkin, Cape Times, Catholic Inquisition, Constable, Corsair, Goa, Guardian of the Dawn, Hitler, Hitler’s Germany, Hunting Midnight, integrity, internationally bestselling novel, interview, Jewish community, Kabbalist, Karina M. Szczurek, Karina Magdalena Szczurek, Karina Szczurek, Lisbon massacre of April 1506, love story, Nazi regime, power, propagandistic lies, Richard Zimler, Sunday Independent, the disabled, The Last Kabbalist of Lisbon, The Night Watchman, The Seventh Gate on December 12, 2014 by Karina. Playing House is the debut poetry collection by the author of The Visitor (2013), a remarkable novel about loss and longing in Cornwall at the turn of the last century. As in her rich prose, in her poetry Katherine Stansfield has an eye for everyday detail. Her poems make us pause and consider. Whether describing a cat trying to get to an interesting-smelling morsel under the fridge, the auction of one of John Lennon’s teeth, the recipe for a crisp sandwich, or “raspberries lured to ripeness by the rain”, she moves from the familiar to the surprising and enchants in the process. Her images are clearly defined. The voice is authentic, subtle but strong. The title of the volume comes from “First Place”, a poem about a couple’s attempts at adult life. Full of thought, fun and beauty, Playing House is the real deal. An edited version of this book mark was first published in the Cape Times on 5 December 2014. This entry was posted in What I've Read, What I've Written and tagged auction, book mark, Cape Times, cats, John Lennon, Karina M. Szczurek, Karina Magdalena Szczurek, Karina Szczurek, Katherine Stansfield, Katherine Stansfield Seren, Playing House, poetry, raspberries, remarkable novel, Seren, teeth on December 6, 2014 by Karina.